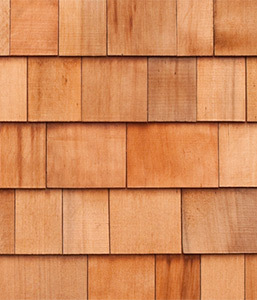 Cedar shingles are sourced from cedar trees grown along the west coast of Canada where the tree can grow to enormous heights and diameters as a result of the high precipitation caused when the Pacific winds meet the Rocky Mountains. 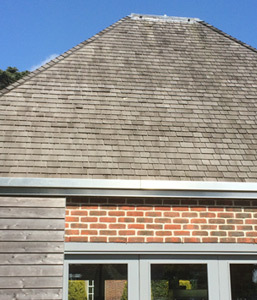 Produced from blocks cut from the log, cedar shingles are then cut to the desired length and fine sawn to produce tapered shingles which are cut to a standard length of 405mm and to random widths ranging between 75mm and 350mm. Cedar shingles are prized for their natural durability, light weight and beautiful appearance and can be used for both the pitched roofs and vertical walls of domestic and commercial properties. Varying in colour from dark chocolate brown to light amber with occasional streaks of pink, they will bleach to a silver colour when left untreated. Unlike most other coniferous softwoods, western red cedar does not contain any resin but the natural oils in Canadian cedar will react with ferrous metals. Vastern Timber stocks the No 1 Blue Label cedar shingles which are the highest quality of shingle available. Shingles produced to this grade are 100% edge-grain, 100% clear of knots and 100% free of sap while other grades on the market will contain more knots and defects. Canadian western red cedar shingles come from well-managed forests in Canada which adhere to the national policy of not only re-planting the species that has been harvested but also doing so in greater numbers. As with all timber supplied by Vastern Timber, cedar shingles will be EUTR compliant and certified where possible. Additionally, cedar shingles have the lowest carbon footprint and the most efficient insulating properties when compared to other roofing materials. Cedar shingles are sold in bundles which cover between 1.75M2 and 3.45M2 depending on the angle of the surface to be covered. Appearance Canadian western red cedar ranges from dark chocolate brown to light amber with occasional streaks of pink. When left untreated, cedar will bleach to a silver colour although the process can be inconsistent and patchy. How to fix Adjacent shingles should be separated by 6 – 9mm.Following joints should be offset by at least 38mm.Alternate joints should not alignTwo nails for each shingle, 19mm – 25mm from the edge and 38mm – 50mm above the end position of the following shingle.Battens of at least 25mm x 38mm to be set at centres equivalent to the shingle exposure. The exposure is the portion of the shingle exposed to the weather. Working properties Works well but is relatively soft and brittle which can result in bruising and splintering. No pre-drilling necessary. Takes paints and stains well. 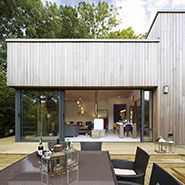 Chemical properties The natural oils in western red cedar have a corrosive effect on ferrous metals, so care should be taken to select silicone, bronze or stainless steel fixings. Fire Treatment Pressure impregnation possible. Be careful of ferrous content in paint on treatments.